Tree guards are fences around the perimeter of a tree pit that provide a physical barrier between a tree and our sometimes harsh urban environment. These tree guards reduce soil compaction, shield the trunk from physical damage, and prevent pet waste from entering the tree pit. Tree guards have been proven to extend the longevity of trees, reduce mortality rates, and can also provide a small protected planting bed for gardening. In some communities, local elected officials are able to provide tree guards around newly planted trees. Please contact your local elected official to see if they fund or if they will consider sponsoring tree guards for your neighborhood. 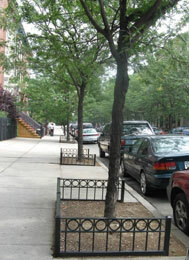 You can donate to the New York Tree Trust to have a guard installed in front of your property. Some block associations even coordinate with residents to establish a uniform style of guard on their block. To find out more, call 212-360-TREE. You can hire a private contractor or look into other lower cost alternatives. To make this process easier, Parks has pre-approved tree guard designs listed below. Please keep in mind that all permitted tree guards are three-sided, at least 18 inches tall, installed on the outer perimeter of the tree bed, and are positioned at least one foot short of the curb with the curbside open. Tree guards should allow for water to flow from the sidewalk into the tree pit. Please be sure to first apply for a Tree Work Permit with the Central Forestry office as all tree guards are required to have a permit prior to installation.